The holidays are just around the corner. 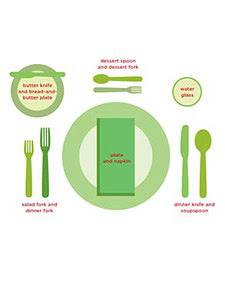 Now is a perfect time to teach your child(ren) about table etiquette because in a few weeks they will be able to apply it. Put your kids to the test by letting them arrange the setting on their own at first, I'm sure there will be a few extra spoons and forks they won't know what to do with. Then you can show them the correct way. Be sure to practice first yourself...you may actually learn something too!